The success of plants depends on their ability to gather and conserve resources from their environment. 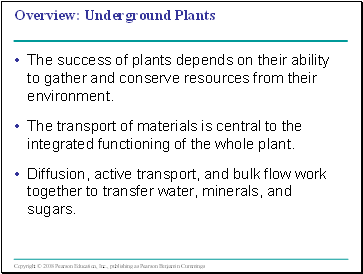 The transport of materials is central to the integrated functioning of the whole plant. 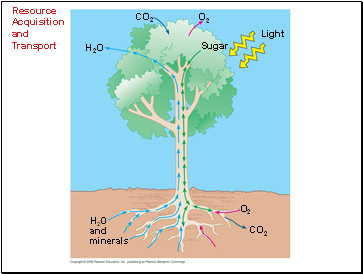 Diffusion, active transport, and bulk flow work together to transfer water, minerals, and sugars. The algal ancestors of land plants absorbed water, minerals, and CO2 directly from the surrounding water. 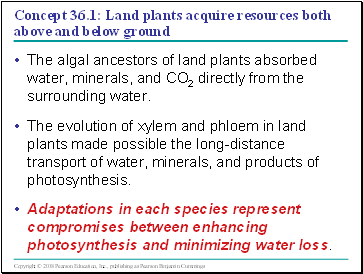 The evolution of xylem and phloem in land plants made possible the long-distance transport of water, minerals, and products of photosynthesis. Adaptations in each species represent compromises between enhancing photosynthesis and minimizing water loss. Stems serve as conduits for water and nutrients, and as supporting structures for leaves. Phyllotaxy, the arrangement of leaves on a stem, is specific to each species. 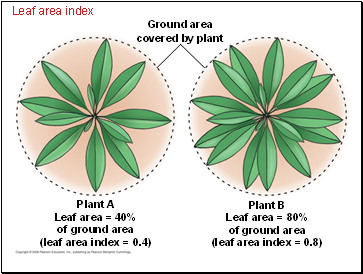 Light absorption is affected by the leaf area index, the ratio of total upper leaf surface of a plant divided by the surface area of land on which it grows. 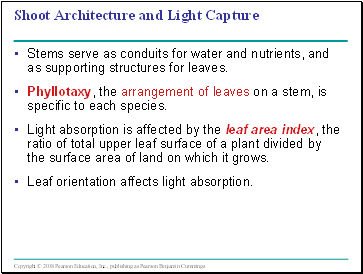 Leaf orientation affects light absorption. 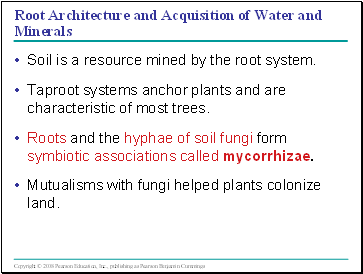 Soil is a resource mined by the root system. Taproot systems anchor plants and are characteristic of most trees. 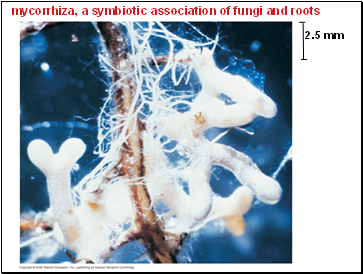 Roots and the hyphae of soil fungi form symbiotic associations called mycorrhizae. Mutualisms with fungi helped plants colonize land. 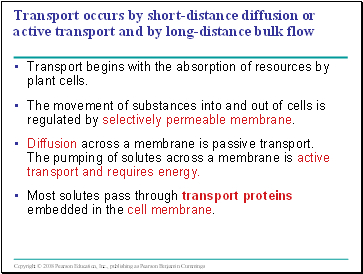 Transport begins with the absorption of resources by plant cells. The movement of substances into and out of cells is regulated by selectively permeable membrane.